I wanted to share an appropriate door for Christmas Eve. The door is correct, but the wreath is not. Or is it? Our weather forecast here in chilly New England, puts the high temp on Christmas Eve just below 70°f – 70 degrees! Some of the bushes in our yard are starting to bloom. I might have taken the pictures of this church closer to Easter, but these wreaths might still work for Christmas. St. Patrick’s wasn’t our church, but we drove by it every Sunday for many years. Our church was St. Adalbert’s, but on the day I took these pictures, St. Adalbert’s was busy. There’s some interesting history surrounding these churches, but I’ll hold that aside until a day when we’re all less busy. Enjoy the photos, the other doors in Norm Frampton’s Thursday Doors series (of which this post is a part). If Christmas is your holiday, have a very Merry Christmas. If you celebrate a different holiday, I hope it is or was happy, or merry or wonderful. I do like how the grid formed by the wires looks like a perspective aid used in drawing the church. Our weather today and tomorrow…sigh. Dan, that is a truly marvelous door. Even the two somewhat lesser versions are lovely. I like the interest that comes from the contrast of the golden colored wood and the black metal. Merry Christmas to you and yours, my friend. Thank you and a Most Merry Christmas to you Teagan. Have a great one, Dan! 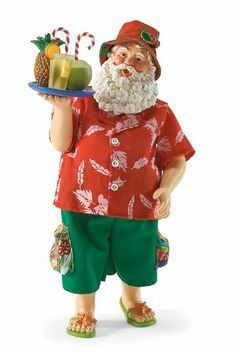 Our weather prediction is the same as usual… hot & humid…Merry Christmas! Thank you and a great 2015! What a great building with beautiful doors! Thanks for sharing. Merry Christmas, Dan. Lovely doors for Nochebuena. Pretty church and doors, Dan. Merry Christmas Eve! Thanks Mary. Wishing you the same. Merry Christmas Dan ! Glad I stopped by for the doors ! 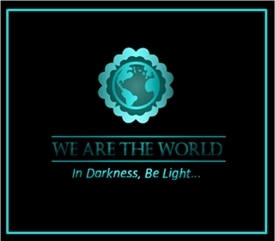 Weird weather – like elves were in charge and were not in the mood for snow this year !!!! That might be the reason John. Merry Christmas. Very nice pictures! Merry Christmas! Thanks Charlie – Merry Christmas to you and yours. So! Many! Doors! It’s very strange, but last night I dreamed about the big stone church I used to go to. I love the fish-eye picture of the front with all the doors, including the modest street-level one pretending it isn’t there. Happy all kinds of holidays! Thanks. I promised I wouldn’t complain about the weather this year. I’m just going to take what comes. Merry Christmas. The doors really stand out against the beautiful stone, Dan. We’re having mid-forties with sun today and tomorrow and after yesterday’s 60’s, grey, and stormy, I’ll take it! The Reason for the season remains, however, unaffected by the weather. So true with the reason for the season. That’s all that matters. Hey, Dan. You won the award this week! Where do I send it? Thsnk you ! Nofacilities@gmail.com should work. I think the wreaths work, and the doors are pretty with their blond wood w/black hardware against the dark stone. I’m looking forward to your post on the history of the building. Thanks Deborah. I’ll circle back once I’m able to get some nice photos of the other church. It’s almost 55 degrees with heavy fog right now. Still, Christmas doesn’t require snow. Merry Christmas to you and your family. Welcome back to the bears. :) The bears will be back tomorrow. I hope! A beautiful choice Dan, I love the carvings above the doors. Weather is wonky here too: high 50’s to low 60’s here today. We’re going to spark up the BBQ for Christmas eve supper tonight – crazy! Thanks Norm. Merry Christmas to you and yours and enjoy the BBQ. Thanks. And to you as well. Thanks Chryssa. I hope you have a very Merry Christmas too. I have never been inside this church but I’ve always admired it from the outside. Yeah, it’s 70 degrees now and my wife is making a white chocolate bark that she would normally let harden on the porch. Now, I might have to take some beer out of the fridge. Merry Christmas Joey! Love the side view of the door, Dan! Great post and very appropriate for Christmas Eve. It’s very warm here too, and in fact I saw two boys skate boarding! I should have snapped a pic for crying out loud! This is one of the warmest Christmases we have ever had. I went walking yesterday at my park and even though it was an overcast and wet day, all I saw were smiles and everyone saying, “Isn’t this a beautiful day?” It was in the 60’s! This is just unheard of for here. One man said we deserve this weather after last year and then some, and I couldn’t agree with him more!! Thanks Amy. The tree is in pretty good shape. The cats are being good. I suspect that once the presents are under it, it will be a different story. Enjoy the balmy Christmas Eve. Tee hee …. um paper and cats …. lethal combo!!! Good luck! Enjoyed the post, Dan. Merry Christmas. And to you John. Merry Christmas. Lovely photos Dan. I recognized that familiar face and pose immediately, we have lots of St. Patrick statues and carvings over here that look exactly the same. Have a lovely holiday. The carving above the doors is just beautiful, Dan. Right down to St. Patrick’s trademark shamrocks! But I wish they’d chosen black for that wonderful detailing on the door though. Looks blue to my eyes, and for me, black would have had such a great visual impact. But regardless (sorry, little miss colour-fussy pants over here! ), a great Christmas Eve door selection! Glad that my power is finally back on so I could read your post. 31 hours it was off. Second Christmas in a row this has happened. O_o Hope you had a wonderful Christmas at your house, Dan! Sorry to hear about the power outage Wendy. I’m glad you’re back on the grid. I’m not sure what color that is. I read once that “if you can’t tell if something is blue or black, it’s blue.” Feel free to be fussy. We had a great day. I hope you did too. Good selection, Dan. Church doors, especially the old-fashioned kind, tend to be my favorite, and these are particularly nice. I like the black bands on the doors and the surrounding brickwork. In fact, the only thing I DON’T like are the yellow wreaths. Not only is the color wrong, at least for me, but they give the impression of two eyes! I’d prefer it “plain”, but it’s still an impressive sight. Thanks for sharing these, Dan — and I hope you, Mrs. A, Faith, and all the pets had a pleasant and relaxing Christmas yesterday. Cheers! We did enjoy the day Paul. Thanks for commenting on these. I wasn’t fond of the wreaths either but I really like this church. You incorporated a sense of humor rarely found on Thursday’s doors, Dan. 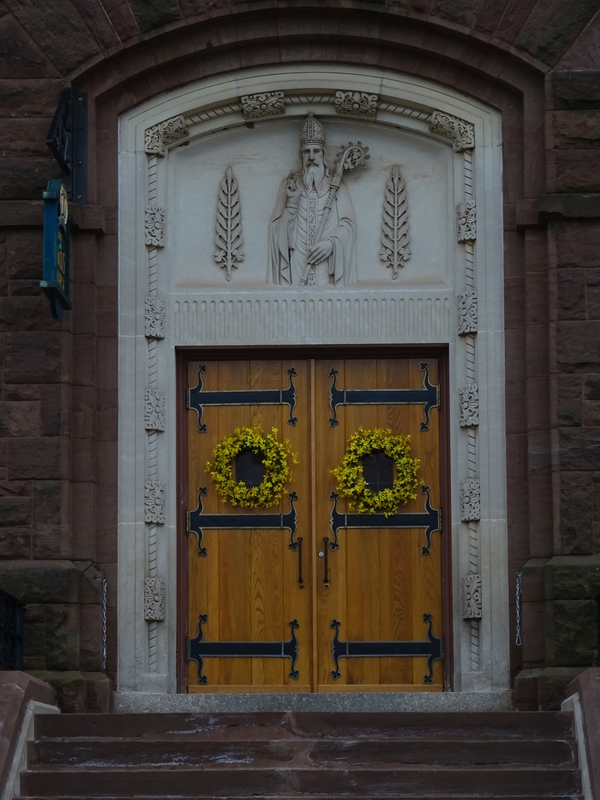 I like the yellow forsythia wreaths but love the St. Patrick church’s beautiful doors. I am sure the golden wood with the pretty black hinge (looking) metal hardware. I wonder why architects today don’t build such buildings instead of those shabby looking glass structures. I think about that same question. I think these buildings are from a time where we valued craftsmanship over profit.